New Rochelle, NY, September 21, 2018–Researchers have developed innovative business models underlying the successful launch of space-related start-up technology companies in Costa Rica. A fascinating article describes how the company DIT (design, innovation, technology) Space identified key market sectors that could benefit from spaced-based technology and how implementation of the technology could benefit the company and create synergies leading to the development of further space technology. 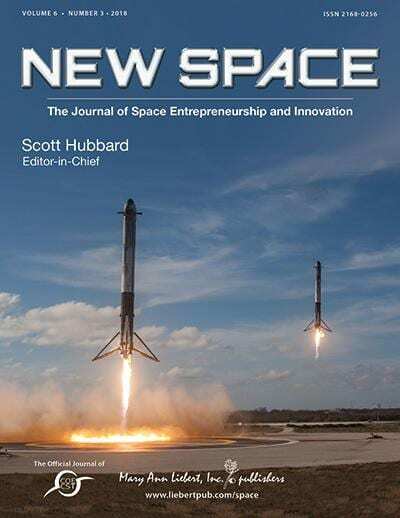 The article is published in New Space: The Journal of Space Entrepreneurship and Innovation, a peer-reviewed journal from Mary Ann Liebert, Inc., publishers. Click here to read the full-text article free on the New Space website through October 21, 2018. New Space: The Journal of Space Entrepreneurship and Innovation is the leading peer-reviewed journal dedicated to facilitating and supporting the efforts of researchers, engineers, analysts, investors, business leaders, and policymakers to capitalize on the opportunities of commercial space ventures. Spanning a broad array of topics including technological advancements, global policies, and innovative applications, the Journal brings the new space community together to address the challenges and discover new breakthroughs and trends in this epoch of private and public/private space discovery. Complete tables of content and a sample issue are available on the New Space website. Mary Ann Liebert, Inc., publishers is a privately held, fully integrated media company known for establishing authoritative medical and biomedical peer-reviewed journals, including Big Data, Soft Robotics, and Astrobiology. Its biotechnology trade magazine, GEN (Genetic Engineering & Biotechnology News), was the first in its field and is today the industry's most widely read publication worldwide. A complete list of the firm's more than 80 journals, newsmagazines, and books is available on the Mary Ann Liebert, Inc., publishers website.